Dr. Delicia M. Haynes, M.D. Summary: This conference trains physicians to start or expand a direct primary care practice (DPC) that is based on the private patient to doctor relationship. Through recurring payments (monthly, quarterly, or annually), patients “contract” directly with their doctor for care for a low fixed fee. By unshackling physicians from paperwork, bureaucracy, and reimbursements, DPC cuts out the middleman to free the doctor’s clinical judgment and create pricing all can afford. The Question & Answer session for Panel 02 covered a wide range of issues delving into the practical application of working with plans and the caution against the slippery slope of engaging plans that evolve into very third party payer systems DPC doctors are fleeing from. Government policy has a dramatic impact on every area of health care. Even before ObamaCare was enacted, extending Federal control over 1/6 of our national economy, voluminous regulations controlled how health care is delivered. Grace-Marie Turner, President of the Galen Institute, unpacked the impact of the regulatory state on the delivery of care with a focus on the results and data coming from the changes ObamaCare made on society. Veteran DPC practitioners field questions in this panel discussion on the next steps to growth for established practices. Especially interesting were extended discussions about the emotional toll of losing patients and the impact of patient panels growing too large. Ryan Neuhofel, M.D. led off the discussion with his experiences in maturing his practice. 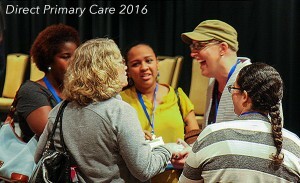 Kim Corba, M.D., author of an extensive DPC practice model manual (DPCmanual.com), spends significant time exploring the wisdom gained in growing too big and boundaries for life beyond the doctor-patient relationship. Josh Umbehr, M.D., founder/owner of Atlas MD, discussed the hard truths of building a model with principles that protect the doctor and business side of medicine. Experienced physicians in a panel discussion on taking the Direct Primary Care practice model to the next level for practices just past the start up stage. Drs Lisa Davidson, Jeffrey Gold, and Nicholas Tomsen open the panel with their story in the DPC practice model before opening the session to question and answer. Seasoned DPC practitioners share experiences, successes, failures, and wisdom in the effort to spread the practice model to all economic and social classes. Essential viewing in this DPC CME catalogue as eight Direct Primary Care doctors from various demographics, economically diverse areas, and stages of practice development hold a wide ranging question and answer session at the conclusion of the conference. The wide ranging session covers a vast array of topics that addressed the gamut of questions that a doctor would have before starting a practice and the questions from those at every stage of life and practice. Moderator Julie Gunther, M.D. kept the conversation moving in this 90 minute session creating the capstone experience for DPC 2017. Doctors with thriving DPC practices built from scratch walk attendees through the steps of building a practice from the ground up. Dr. Delicia Haynes of Family First Health Center, Daytona Beach, FL, Dr. Jennifer Harader of Oasis Family Medicine, Topeka, KS, and Vance Lassey of Holton Direct Care, Holton, KS all share their stories and advice in short presentations with an extended panel question & answer period. Phil Eskew, D.O., J.D., MBA is becoming legendary in the scope of his service to the DPC movement. A lawyer and DPC practitioner, Dr. Eskew digs deep into the details of legal contracts, patient relations, marketing pitfalls, and general dos & don’t in forming a practice. This talk is essential for the startup and important for the established DPC practice as a check up on maintaining your compliance and protecting your practices. Jay Kempton from the Free Market Medical Association digs into the details of plans with employers, the tax advantages, and benefits for both sides of the relationship – employers & DPC providers. Chris Markford, CASC kicked off the second panel of the 2017 Direct Primary Care Conference unpacking the principles that undergird the practice model. His lecture, entitled “Free Market in Health Care”, explained the basics of how to position a DPC practice and the fundamentals of understanding the role of the free market in health care. Docs 4 Patient Care Foundation President, Dr. Lee Gross, presents real world numbers from his years of experience operating a Direct Primary Care practice in Florida. From an explanation of the cost drivers to innovations in delivering low cost supplies, tests, and medical services to patients, Dr. Gross explains the nuts and bolts of how to cut out the middle man and build a thriving practice. Crowd pleaser Doug Farrago, M.D. brought his bare knuckles approach to bear for our Luncheon Keynote at the 2017 Direct Primary Care conference in Orlando. His narrative, DPC: The Hero’s Journey, was part autobiography, part data, part philosophical reflection and all challenge for doctor’s to step up and be the salvation of primary care for both doctors and patients. While available in MP3 for podcast download on the go, consider watching the video streaming online with the integrated powerpoint overlay to capture the nuance of this animated talk (that flirts with a PG-13 rating). After the video, visit authenticmedicine.com to stay abreast of the work, news, and reflections of one of the firebrands of Direct Primary Care. 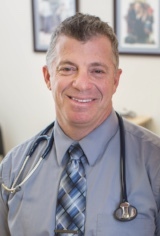 Dr. Eskew is a family physician and attorney that practices in the Direct Primary Care setting. He founded DPC Frontier in Feb 2015, joined ProactiveMD in Feb 2016 and is the company’s VP of Clinical Development and General Counsel. He completed his family medicine residency at the Heart of Lancaster Regional Medical Center in Lititz, Pennsylvania in June 2015 and was honored with the American Osteopathic Foundation’s Outstanding Resident of the Year Award in Family Medicine. His research has been published in the Journal of Legal Medicine, the Journal of the American Board of Family Medicine, Family Practice Management, and the West Virginia Medical Journal. Dr. Eskew has advised state and federal legislators about DPC legislation and is the general counsel of the Direct Primary Care Coalition where he also serves as a member of the steering committee. Historic Perspective – How We Got Here – Dr. Ryan Neuhofel, D.O. Detailing the appeal and growth of DPC. How we got here. Raising the Bar in DPC Entrepeneurship – Dr. Julie K. Gunther, M.D. Defining the Winning Formula – Dr. Josh Umbehr, M.D. Implement value and understand why practices succeed. Can DPC Save Money? – Dr. Chad Savage, M.D. All the doctors from Panel 01 field questions from the physician audience about direct primary care. The wide ranging discussion is always a favorite for getting to the nuts and bolts of starting and maintaining a DPC practice. Former Presidential Candidate Herman Cain delivers the keynote speech that became a challenge to doctors to take back medicine. From analyzing government policy to explaining the basics of human nature, Cain takes the audience on a wide-ranging discussion that combines American political philosophy with good old fashion common sense. DPC: A Direct Primary Care (DPC) practice ends the obligation to third party payers and the endless fights with forms, regulated cook book care, and seeking reimbursements. In a DPC practice, you are opting out of the insurance and government systems and you will join the rising tide of thousands of doctors resurrecting their calling to care. 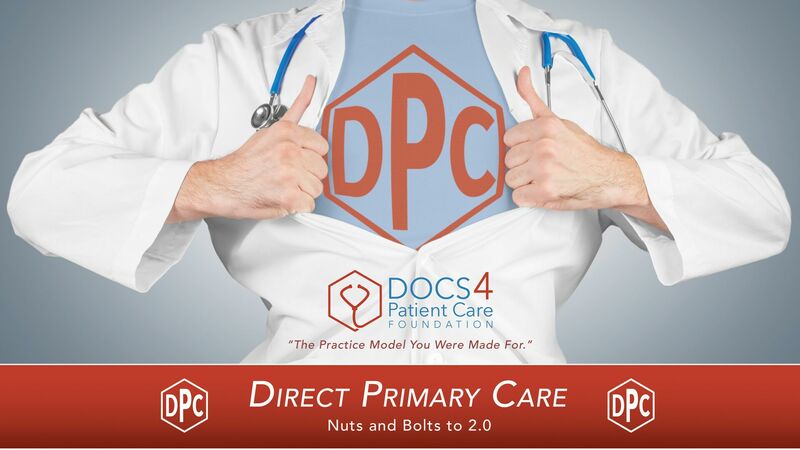 The Direct Primary Care Conference – Nuts and Bolts to 2.0 is doctor to doctor training covering the spectrum of need in developing a practice – from start up to strategies to expanding your patient panel and profitability in an existing practice. The Docs 4 Patient Care Foundation, supported by the Florida Medical Association, offers an intensive two day CME (continuing medical education) course free of charge thanks to a generous grant from the non-profit Physicians Foundation. This training is provided for free because we are certain this practice model is a key part of the solution to the American difficulties in delivering actual care at up-front, affordable pricing for virtually everyone. 70%-80% of all health care issues can be resolved at the primary level in family practices. This is how we rebuild the front lines of American medicine and resurrect the joy in being a doctor. This second Direct Primary Care conference will train you on the basics of how DPC works, the nuts and bolts of setting up a practice, and allow you to personally engage with physicians already in established practices. ● Detail the appeal and growth of DPC. How we got here. ● Analyze successful and failed practices. Our speakers come from varying population demographics ranging from rural communities to dense urban centers with varying practice sizes giving you access to mentors that will understand the obstacles you face and offer advice long after the conference is over. Our prior DPC conference gave birth to a family of physicians sharing their innovations, failures, and lessons learned along the way. The enthusiasm for this practice model is infectious as attendees realize they can opt out of the system and be a full time doctor with colleagues cheering them on along the way.